I’m late to the podcast game (as I am with most tech trends). But after I did my final round of the I’d like to cancel no thats still too expensive oh wait you can do it for basically free siriusxm waltz, I needed something to get me to daycare, work, daycare, and home again. So I picked up listening to podcasts. My current favorite is Ear Hustle, which I find fascinating and complex and eye opening. So I figured I should review Ear Hustle. Ear Hustle is produced inside San Quentin State Prison in California. And no, it’s not stories of how the residents became inmates, but rather stories of the lives they are living inside prison. Yes, I said lives they are living. Which is probably why I find Ear Hustle so fascinating. It reminds you that prisons are full of people. And for the most part, outside of the fact that each show needs to pass the smell test of the San Quentin Public Information Officer, it’s pretty real. Real stories of real people doing real-life things. The part I’m most intrigued by is how the residents at San Quentin have formed a community. It’s like there is this town that’s similar yet so very different from where I live yet it’s a town all the same. I don’t know why I’m surprised by the fact that the prison has formed a community; the inmates are human after all, and humans tend to be pack animals (as well as creatures of habit). So, regardless of your views on our prison system, I would encourage you give Ear Hustle a listen. You never know, you just might learn something. So now that I’m back in the world of the living after a hiatus to break up with the guy I was seeing, meet a new guy, get married, and have a baby, I decided to try Rent the Runway Unlimited. I’m about a week in, and here’s my review of RTR Unlimited so far. RTR Unlimited is essentially Netflix for clothing. You pay a fixed monthly fee, and pick out four items – dresses, tops, skirts, even accessories- to start. Being the Netflix of clothing, you can keep each item as long as you want, or send them back, together or individually. With a trial offer of a month for $99, it’s near the same cost of doing a single dress rental. I figure I can be fairly aggressive on my returns and really get my money’s worth. You can keep items as long as you want. Unlike the traditional RTR rentals that need to be returned super quick, you could keep that stellar bag for a few weeks, or take some items on vacation with you. The selection is really broad, and you have access to a lot of high-end and designer items. No, I will not buy a $1200 red jumpsuit but sure I’ll give it a go as a rental. It overall just feels FUN. Being a mom, I don’t have a lot of time and daycare takes most of my spare change. So, I feel like I can get some variety to spice up my wardrobe without breaking the bank. Shipping time is a bit disappointing. I signed up last Saturday (May 26), and my first set of four items didn’t arrive until May 31. I understand Memorial Day was in there, but I think a week for shipping is just unreasonable, especially given how fast other subscription services are. You don’t get to pick out a new item until your current items arrive AT the RTR locations. Unlike other services where you can swap out as soon as your package is in the shipping pipeline, in this case, you have to wait until it gets back to the RTR warehouse AND gets scanned in. I’m estimating that this adds at least 3 days to the whole return process. Not all sizes/items are available on the Unlimited subscription. So, if you want a specific item on a specific date, you’re better off with a traditional rental. My review of Rent the Runway Unlimited is a solid B- so far. While I didn’t like three of the items I received, I did get a fun dress that I plan on wearing to an event this weekend. And, since I’m ready to ship three things back right away, I think I’ll be able to pick out some new ones fairly soon. I’m sure by now everyone has seen the “Things that won’t make you feel young” that has been bouncing around the interwebs. But, I was lucky enough to get ID’d at dinner on Tuesday yessssssssssssss still got it. So, I though I would make my own list of some things that never make me feel young. My interns don’t know what an “away message” is. And the concept of not communicating via away message after a bad breakup is foreign to them. Did I mention that they were all born after 1990? My high school presentations involved poster board, not PowerPoint. I had a cell phone that didn’t vibrate and didn’t receive text messages. Not because I didn’t have a text message plan, but because TEXT MESSAGE DIDN’T EXIST. I think of Sabrina the Teenage Witch as Clarissa. Miley Cyrus is old enough to be engaged. I used to have “Achy breaky heart” on cassette. Enough said. Back in my day, that meant a solid two hours of Full House, Family Matters, Boy Meets World and Step by Step. And if you were really lucky, you got to stay up after TGIF to watch Snick…all I have to say about that is, are you afraid of the dark? First, there was the delightful NYT piece about how living alone apparently turns you into a pantless alcoholic. With a penchant for sweet potatoes. Then, I received the following two Groupons in THE SAME WEEK. 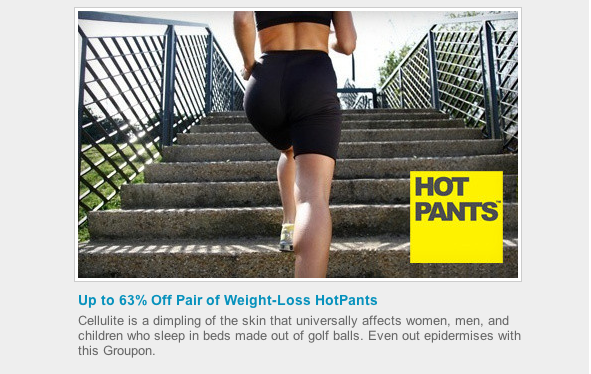 Because I’ve always coveted a pair of weight-loss hot pants. 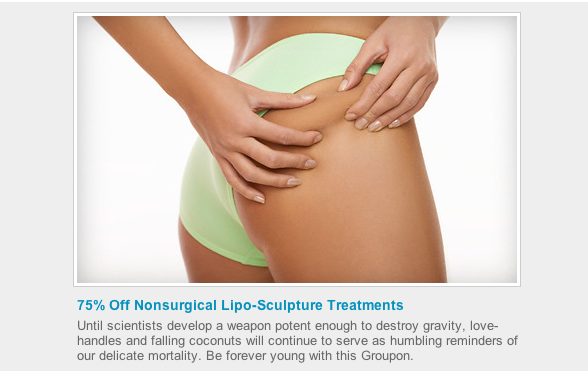 And non-surgical lipo. Seriously, Groupon? Why don’t you just try to sell me an ab-zapping belt, the Shake Weight, Sensa and a variety of Billy Mays products? Since, you know, you’re hawking such reputable great deals lately. Personally, I’ll just stick to the Paris Hilton diet of starvation and martinis. And Spanx. Citing a survey of Finnish people (because we all know Finnish people are like, totally par for the course when it comes to life), approximately 25% of people who lived alone filled a prescription for antidepressants, compared with 16% for those who lived with family, spouses, roommates, and other varieties of cling-ons. OMFG. Call Sanjay Gupta. There’s a whopping 9% difference. The best part? The same study points out that women living alone have a higher risk factor for depression because of their tendencies to have “lower incomes, less education and poorer housing conditions.” I’m sorry, I just hallucinated. Are we back in 1950? Does the concept of “correlation does not equal causation” apply here at all? It’s a good thing they put it in such simple terms and all, because otherwise my tiny hamster brain wouldn’t understand. And heaven help the single woman who lives alone in West Virginia and works as either a nursing home or child care provider. Because then you have the trifecta: living alone in the most depressed state in the country with the most depressing job in the country. Or so says this piece. I’d like to know why everyone is trying to rain on the “living alone” parade. Because I’ve always thought that those who rain on your parade are just angry that they have no parade of their own. So parade on, solo-dwellers. You can always order some weight-loss hot pants if you get lonely. Who Dreams of Owning a Mini-Storage? A really, really, fast car. A closet that would make California Closets jealous. A parking spot at Google headquarters. Did I mention the Yankees? Lear jets. With John Travolta as the pilot. I’ve got…a friend. Who claims her husband’s dream (dream?????? seriously? DREAM????) is to own a mini-storage. Said friend has even put an offer in on a mini-storage park. And by “offer” I am referring to an OFFER TO PURCHASE a mini-storage. And no, I didn’t take a trip to The Land of Make Believe. This mini-storage sitch exists in real life, man. But enough about mini-storage. Who wants some cake? 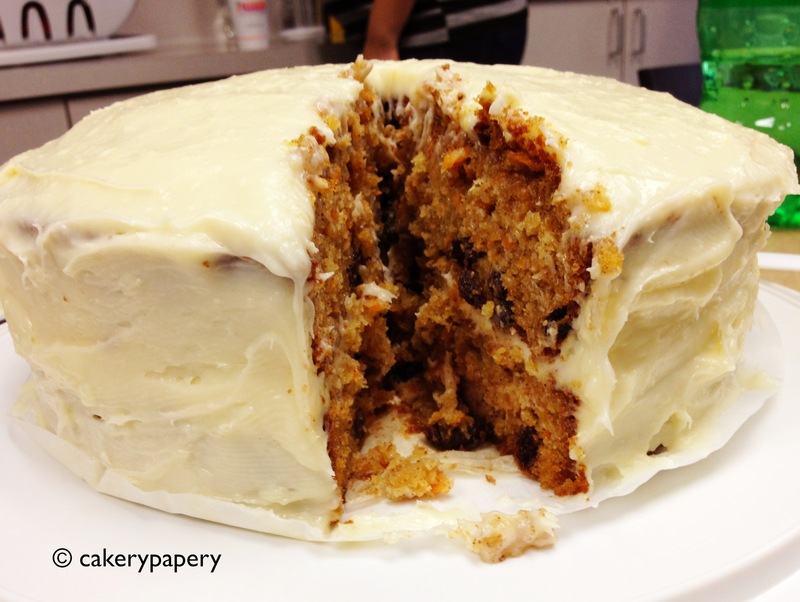 As in, the best carrot cake EVER. Seriously. The. Best. This time around, I tried not to be so much of a “food pornographer,” as my future husband Anthony Bourdain would say. 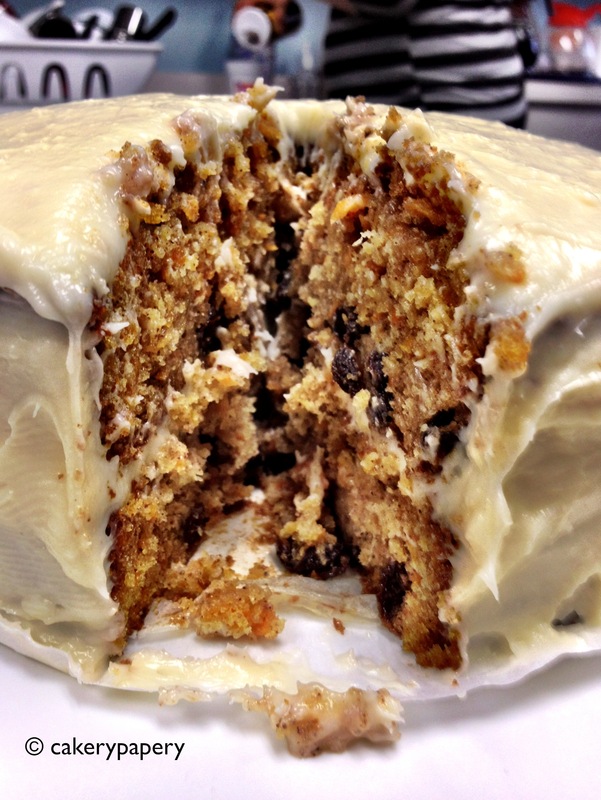 So I’ll just give a quick run-down of the best carrot cake ever. This recipe is from Sticky, Gooey, Creamy, Chewy. Her photos are much more…controlled. 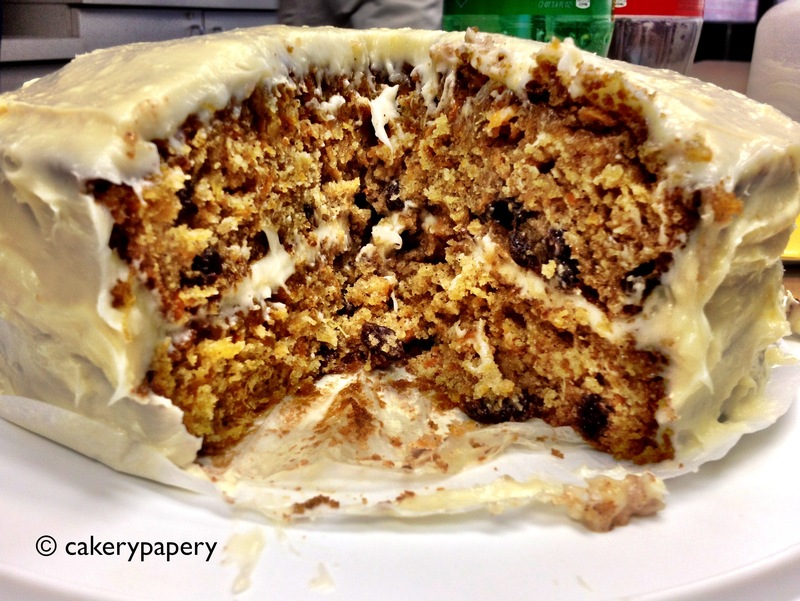 I suspect she did not photo her cake at 8:30 a.m. in the office kitchen with a tiny plastic knife while convincing those around you that carrot cake is clearly a breakfast food because carrots are high in beta carotene. The recipe makes enough batter for three layers, but as I somehow only have one cake pan…and didn’t figure that out until I had made cake batter…and was cooking at 10 p.m., I ended up with two even-ish sized layers. On the plus side, only having one pan ensured I only put one pan in the oven at a time, ensuring even oven air flow. Another thing I really LOVED about this recipe is that it calls for crushed pineapple, not coconut. Weird, I know. A lot of carrot cake recipes call for coconut, which I am not a fan of. This one is full of delicious things like carrots and nutmeg and cinnamon and pineapple and sugary goodness. When it’s in the oven, your house will smell heavenly. I was a bit worried about running out of frosting, but the recipe made just enough. I use almond extract in my cream cheese frosting for a good hint of flavor and something a little different from vanilla. If I could eat this cake every day, I would. Preheat your oven to 350F. Mix the flour, baking powder, baking soda, cinnamon, salt and nutmeg together. In an electric mixer, combine the eggs, sugar, oil, buttermilk, sugar and vanilla together until well combined. Stir in the pineapple. Add in the dry ingredients until fully incorporated. Stir in the carrots and raisins until they are evenly distributed (I did this by hand, not with the mixer). Grease and line with parchment paper two 9-inch cake pans. Divide the batter evenly, and bake one pan at a time for 35-40 minutes at 350F. Cool the cakes 10 minutes or so in the pan, then remove and continue cooling on a wire rack. To make the frosting, combine the cream cheese, butter and extracts. Add in the sugar until the frosting has the desired consistency. Why does the girl always have to play it cool? And have you ever noticed how playing it cool almost definitely guarantees that you will turn into a stark raving mad lunatic? Because “playing it cool” means we sit around and analyze. Every. Little. Thing. And then before you know it you’re the crazy woman shut up in the attic a la Jane Eyre. Don’t respond to his text message right away. Wait a few minutes so you don’t look too free but not too busy either. Great plan! Waiting 11.38 minutes to respond will certainly make him realize how awesome I am! Be available but not too available. Say you’re busy the first day he suggests for a date. Amazing! I definitely should stay home and watch Justin Bieber videos on a Friday instead of going out with someone who actually is interested in going out with me. Wait until the he has made 37.6 grand, sweeping gestures that declare his undying love and devotion before you do something nice for him. So smart! I’ll act like I could care less because that is the sure fire way to show him I’m into him. Whatever you do, DO NOT ask him out. Not for drinks, not for coffee, not for anything. Why didn’t I think of this one before? It makes so much sense to ignore a person that I want to hangout with! Just insert an obscene amount of waiting by the phone, reading into things that mean nothing, telling yourself to “keep the crazy in check” and “act normal,” and find a few friends who give perennially enlightening advice like “just remember to play it cool, girl.” And you’re totally on your way to a life of love and happiness. Which brings me back to the original question: why does the girl always have to play it cool? Why is it that when men do nice things for a girl it’s romantic, but if a woman does something she’s desperate and/or psycho? One of my Lenten resolutions is to stop being someone else’s version of me. So I’m going to stop attempting to play it cool. Because lets be reasonable. I watch Justin Bieber videos on YouTube. I’m more Bridget Jones than Princess Kate. And being the cool girl doesn’t prevent you from sailing on the good ship disappointment towards the isles of heartache and disaster. So I’m just going to be my slightly neurotic and sometimes crazy but completely passionate, honest, authentic self. If you want a girl that can “play it cool,” she’s not me.